India’s attempts to incorporate aspects of Swiss-style vocational education and training (VET) could stumble without industry involvement and investment. As one of the fastest growing economies with the world’s largest youth population, India seems poised to cash in on its demographic dividend. However, according to the Organisation for Economic Co-operation and Development (OECDextrenal link), close to 30% of Indian young people (aged 15 to 29) are neither in employment nor in education or training. Even the country’s engineering graduates are under pressure, with around 60% of the 800,000 that pass out every year not sufficiently prepared to secure a job. “The kind of people we churn out of our education system are not job ready,” Sunita Sanghi, adviser to India’s apex planning body NITI Aayog, told Swiss and Indian VET providers at an event organised by the Indian embassy in Bern on September 20. The government is aware of the problem and has created a Ministry of Skill Development and Entrepreneurship, and has rolled out schemes that pay those willing to undergo training courses in specific skills from affiliated providers. But a reportexternal link by a committee created to assess these schemes criticised them as “badly implemented with very poor employment outcomes”. According to the National Skills Development Corporation, only 8.5% of those trained managed to find employment. One of the reasons for the disappointing performance of government-led skills development schemes was a lack of industry involvement. “If the skills ecosystem has to succeed, the employers must be closely and intensely involved with the Vocational Education and Training System,” stated the report. The committee recommended that companies “own, finance and drive” Sector Skills Councils to ensure they deliver on equipping India’s youth with the skills to find a job. This is where lessons can be learned from the Swiss dual education system. In Switzerland, almost 70% of students opt for vocational training stream at the age of 16 instead of university. This means the trainee spends most of their time working for an approved employer but attends a vocational school for one or two days a week. Largely thanks to this apprentice system, only 8.5% of all 15-24-year-olds in Switzerland are unemployed, one of the lowestexternal link rates in the world. The system depends on companies that are willing to train apprentices. According to Bernard Wicht of the Swiss Conference of Cantonal Ministers of Education, private firms contribute CHF4.7 billion ($4.5 billion) a year to Swiss VET compared to CHF3.4 billion from the cantons (states) and CHF700 million from the federal government. “When we look to promote investment, we must also think about the potential for having more apprenticeships,” he says. Wicht also warns that it takes time to make significant progress in increasing the number of apprentices. “Canton Fribourg took ten years to double the number of students in VET even though Switzerland has a long apprentice tradition, and structures and institutions already exist,” he says. Laura Antonelli of the State Secretariat for Education, Research and Innovation (SERI) also agrees that Swiss conditions cannot be replicated elsewhere, and that companies in India need to first be convinced that apprentices will benefit them. “Research can be useful in helping companies understand the cost-benefit of offering vocational education and training,” she says. 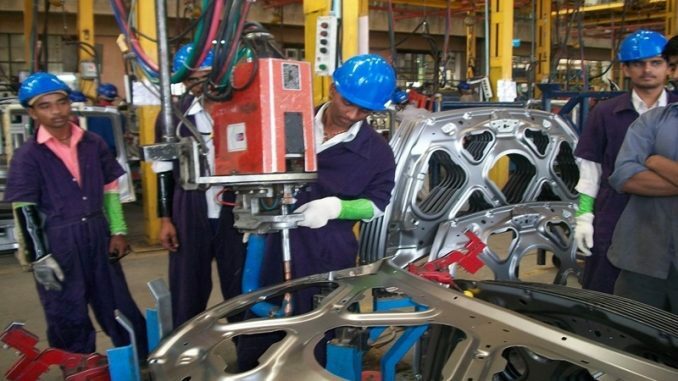 There are more than 20 Swiss companies in India that employ approximately 100,000 people. They offer a glimpse of what is possible with Indian firms’ involvement. In 2008, a pilot project called Swiss VET Initiative was launched to help Swiss companies in India find skilled technical staff and to demonstrate that Switzerland could be a great partner for VET. Select students who had completed two years of Indian vocational education at Industrial Training Institutes (ITI) were offered an additional two years’ training in the Swiss VET model. The total cost per trainee in 2013 came to CHF20,345, of which companies provided CHF4,838. All of the 121 apprentices trained are in employment. Swiss companies like Burckhardt Compression, Sulzer and Rieter have also pooled resources to create a Centre for Excellence in Manufacturing that is expected to be operational by 2017. It will be based in Koregaon Bhima near the Indian city of Pune, where over 20 Swiss companies have manufacturing units. Apprentices must undergo a four-year training programme in disciplines such as polymechanics, mechatronics, welding and design. Each course will have an annual intake of 24 students and will admit students who have passed the tenth grade and have a certain level in mathematics. Apprentices will spend four days a week working for a Swiss company from the third year onwards and will be paid a stipend. Other Swiss companies like Schindler operate their own in-house training programmes to ensure that technicians meet rigorous requirements. There is no room for error in their business. “When you install an elevator, it needs to be done to a very high standard as the safety of our customers is at stake,” says Robert Obetkon, manager of strategic planning at Schindler.